(Nanowerk News) With would-be goblins and ghosts set to drape those huge fake spider webs over doorways and trees for Halloween, scientists in Wyoming are reporting on a long-standing mystery about real spider webs: It is the secret of spider web glue. The findings are an advance toward a new generation of biobased adhesives and glues — “green” glues that replace existing petroleum-based products for a range of uses. A report on the study was published in ACS’ Biomacromolecules ("Spider Web Glue: Two Proteins Expressed from Opposite Strands of the Same DNA Sequence"). 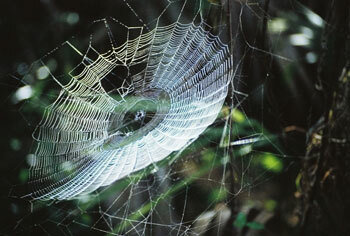 Omer Choresh and colleagues note that much research has been done on spider web silk, which rivals steel in its strength. However, scientists know comparatively little about web glue, which coats the silk threads and is among the world’s strongest biological glues. Past studies revealed that spiders make web glue from glycoproteins, or proteins bits of sugar attached. The scientists analyzed web glue from the golden orb weaving spider, noted for spinning intricate webs. They identified two new glycoproteins in the glue and showed that domains of these proteins were produced from opposite strands of the same DNA. “Once the cloned genes are over expressed in systems such as insect or bacterial cell cultures, large-scale production of the glycoprotein can be used to develop a new biobased glue for a variety of purposes,” the report notes.